-Suitable for almost all the ages. -Made from high quality PP Film, environmental and makes the surface slippery enough to produce the ice-like effect of easily sending the stones. 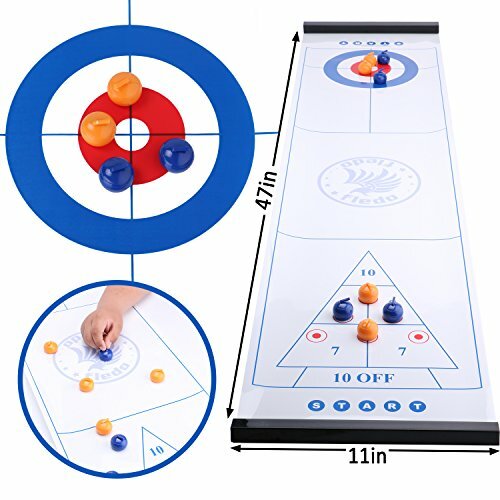 -This curling tabletop game is suitable for adults and children to play together.It is beneficial to foster the communication between children and other family members. -This table-top curling game, is a more-fun-than-it-looks kind of board game, and the kids will be more than delighted when you introduce this game to them if they've never played it before. -Make up for the lack of sports in life. -It is an excellent tool to train children's eye-hand coordination. Makes children realize the importance of teamwork during the game. -This curling Table game is perfect to be one of the office leisure time activities. You can get relaxed and release pressure by playing it with colleagues to a large extent. Puzzle Game: Tabletop curling、shuffleboard & bowling. It is a more fun than board game. It is not just pushing the ball but about strategy and skills. Multipurpose: This is an excellent tool to train children's eye-hand coordination. Effective way of training children's capability of independent thinking.Suitable for almost all the ages. Widely applied: Ideal for playing indoors or outdoors, when you go for a picnic, camp or travel. It is easy to take and store rolled up in a box. You can get relaxed and release pressure by playing it with colleagues to a large extent. Easy to Install: This curling board game is easy to carry and set up. Just find a smooth surface and open the box in a few seconds , then you can start your fun time! Including: A set of tabletop curling including 8 tabletop curling balls, 6 bowling balls, 1 storage bag, 1 curling board, 2 magnetic stripes. If you have any questions about this product by Fledo, contact us by completing and submitting the form below. If you are looking for a specif part number, please include it with your message.